I would start a movement where we focus on the people in the world who don’t feel like they belong, feel disenfranchised or alone. Some of these people leave this life because they feel so alone. Others join cults or fringe groups who serve as a place where they feel accepted and seen but in reality, use them to carry out horrendous crimes and terrorism. And then of course others take their feelings of anger or rejection and take it out on strangers. If we could provide the acceptance, the welcoming, the love and in some cases mental health to these people we could start feeding the spirit of the world that is currently sick. This world sickness is spreading and causing more mass shootings, more terrorist attacks and more suicides. This can’t be changed by ignoring it, any more than by fighting fire with fire and guns with more guns, but by healing the hurt and pain at the root of the problem. I had the pleasure to interview Ruby Rose. Ruby is a global film and television award-winning actress, accomplished DJ and effective advocate for LGBTQ rights. Rose has dominated the box office in hit movies (THE MEG, PITCH PERFECT 3, JOHN WICK: CHAPTER 2) ever since her breakout role on ORANGE IS THE NEW BLACK. Rose recently landed the title role in Batwoman, premiering on the CW in 2019. 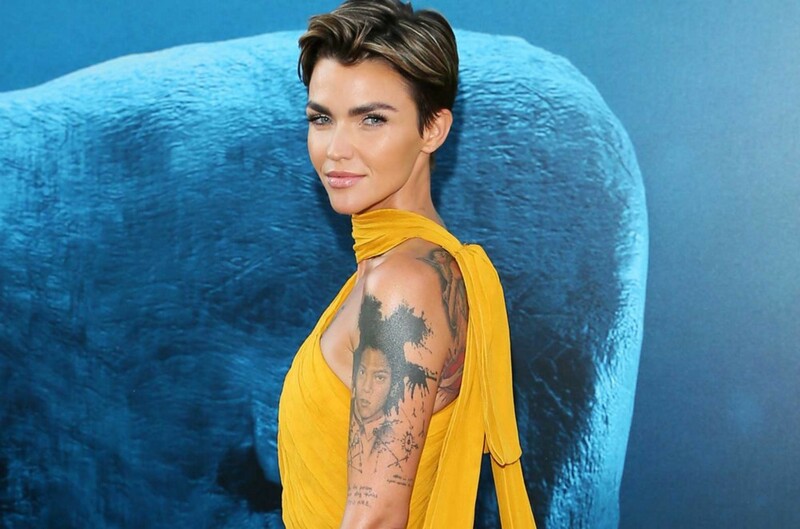 Ruby Rose is trading in her orange jumpsuit for a red logo as she announces her new partnership with REBBL, a vegan, organic, super-herb powered beverage brand. After being named this year’s “most dangerous” celeb, a partnership with this rebellious brand is a natural fit. A longtime vegan and advocate for an herb and plant based diet, Rose has been known to travel the ends of the earth to source the proper ingredients needed to fuel her body. Upon discovering REBBL in her local Whole Foods, the actress realized the coconut-milk based elixirs contained the very super-foods she had been seeking all along. Rose felt a strong connection with the brand’s products, philosophy, and its mission to eradicate human trafficking with non-profit partner, Not for Sale; she took it upon herself to get involved. This collaboration is a true passion project for Rose, who plans to be more than just a financial partner to the beverage brand. She feels strongly that super-herbs should be more accessible and is on a mission to help people incorporate them into their diets. She’ll be an active participant in strategic brand planning and creative development, as well as helping to drive awareness to REBBL and the good work they do. In her first business investment, Rose is joining the ranks of other celebrity beverage brand investors like Beyonce (WTRMLN WTR), Diplo (MatchaBar), Justin Timberlake (Bai), Leonardo DiCaprio (Runa) and more. Thank you so much for joining us! Can you tell us a story about what brought you to get involved with REBBL? Well, I have always been very intrigued and fond of Eastern medicine. I was introduced to Reishi and its benefits for the immune system and from there I dove further into natural medicines, herbs and roots because I found the results to be unparrelled. I would make my own Reishi coffees, and elixirs but they were not the most pleasant tasting. When I was at my local Wholefoods I grabbed a few Rebbl to try them out and became addicted. It saved me time in the morning and tasted far better than anything I created. I stalked the company for a little while and then reached out about becoming an investor so I could save money on my growing habit haha, and because I wanted to help the company grow and be part of something that I think is extraordinary. I just finished the CW crossover event as Batwoman, I flew home for one day to give my dogs as much love as possible, then got on a plane to Budapest to shoot a film until the end of Dec. I have a few exciting projects in the works, I feel very blessed. Who are some of the most interesting people you have interacted with in your search for natural medicines? What was that like? Do you have any stories about traveling the world and finding these herbs? It started with my eastern medicine doctor, he was helping me deal with my Adrenals which were always depleted from stress, travel, lack of sleep and my addiction to work. He is a fascinating man. I have traveled China many times and met very interesting people at the food markets who showed me even more Herbs, roots and mushrooms, it was overwhelming but remarkable. Then when it was fully integrated into my life I met people at Rebbl who educated me even more. Then I added a Chinese Martial arts/meditation practice called Qi Gong and I tell you what, that combination has changed my life and health. I would start a movement where we focus on the people in the world who don’t feel like they belong, feel disenfranchised or alone. Some of these people leave this life because they feel so alone, others join cults or fringe groups who serve as a place where they feel accepted and seen but in reality, use them to carry out horrendous crimes and terrorism, and then of course others take their feelings of anger or rejection and take it out on strangers. If we could provide the acceptance, the welcoming, the love and in some cases mental health to these people we could start feeding the spirit of the world that is currently sick. This world sickness is spreading and causing more mass shootings, more terrorist attacks and more suicides. This can’t be changed by ignoring it, any more than by fighting fire with fire and guns with more guns, but by healing the hurt and pain at the root of the problem. My mother used to tell me “success is the best form of revenge” and it is what gave me my drive to work hard to succeed. But then when I got to places I never imagined I would it stopped driving me and I realized my younger self and inner child didn’t care about those things so much as she needed to be loved and happy. Turns out this is someone else’s quote haha I just thought it was my little secret. Bill Gates and Oprah, both are doing amazing things to better the world and find solutions to problems in ways that are beyond donating money, but by starting grass root solutions, investing in long term sustainable ideas to help the planet and by educating people. Also Leonardo Di Caprio, I mean, I have met him a few times, he’s wonderful. Yet I have never been able to sit and talk to him about all the times I looked up a product or foundation thinking I had discovered something on the cusp of breaking only to discover he invested in it years earlier haha. I am taking a long break from Twitter as I find having all these social media channels to be taxing, and very time consuming if not outright distracting, I am on Facebook but I have some concerns with the platform, so I am less active there. Really, I should just do what most people do and learn to off load it to someone else even just for periods of time, but I find the idea of anyone or a company speaking as me or representing me in that way to be terrifying. At least for now. I just wouldn’t feel like it was authentic.